As delicate as it may seem, one would never realize unless one closely observed, what this attractive beauty is in real. 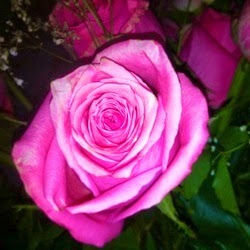 Just as we see pretty people in this world, a rose too seems to be one of the most attractive beauties of nature. One would never be able to tell by its looks until one touches it. The people we see now a days seem to have become fake. They have failed to understand life as it is and in turn end up getting hurt. They should try and be like a rose, which looks delicate and attractive but when touched by it's enemies, can protect itself by it's thorns. Life isn't as easy as it may seem. Thus, one needs to have the means to protect himself/herself no matter what the situation might be. So, in order to survive in this fake world, one needs to be a rose in the beauty of life.